Iroko is big tree grown up from west coast of Africa Tropical areas. Inspired by this very exotic African timber effect, Gerbur Aqua click-Iroko adds that extra dimension and luxury to your interior. Unlike the solid wood floors, these vinyl tiles are made from environmentally friendly sustainable materials which are 100% recyclable. Now, you can get that sought-after real wood floor look without harming nature. 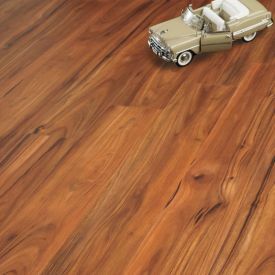 Vinyl flooring is also 100% water proof unlike real wood flooring, which makes it possible for you to have beautifully natural wood tones with Iroko Vinyl tiles in any space of your home, from kitchen to bathrooms with minimum maintenance.